What is very green color-wise, but doesn't cost a lot of 'green?' 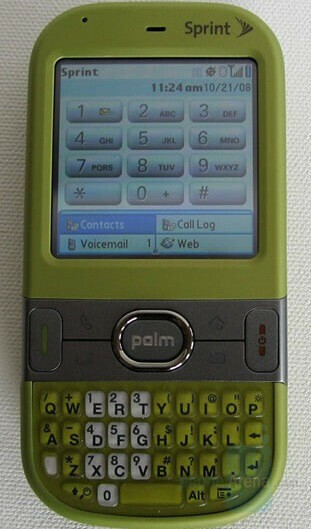 The new olive green Palm Centro smartphone, destined to Sprint. We had mentioned the release of it before, however PalmInfoCenter has garnered some nice promotional shots of the unit. Speaking in regards to pricing and availability, it is expected to be "as low as" $79.99 after a $100 mail-in rebate, and though it is already available in select retail channels, it should launch in corporate channels on November 2nd. Ryan at PalmInfoCenter has noted some different details about this batch of Palm Centro's, such as the darker gray trim around the navigational buttons and sides, a soft touch finish (thus removing the problem of fingerprints, for the most part), and a "more grippy keyboard." He also notes that the Centro line is now available in seven colors. Click through for more images of the device. C'mon sprint. All other companies are introducing the Omnia, Storm, G1.... Is this the best you've got? Oh and what a lovely color it is. sprint launched the diamond and touch pro not to mention a slew of high quality comsumer devices. The touch diamond and pro are ok but don't compare to these. In fact they're quickly becoming obsolete along with the instinct. And I serously question the other "high quality consumer devices" your speaking about. the diamond and touch pro are 2 of the top selling high end devices internationally.... so what are you talking about? Thats about the best part of it outside the screen. But its all a matter of perference. If you like the diamond with its limited memory and burgundy back cover thats great but for me its not practical for typing. Im not saying the omnia is the best either even though it has 8 gb built in memory, microsd, 5 mp cam,larger screen. I know, you probably regret buying the diamond so you get upset as soon as someone points out the truth about that phone. Believe me that phone is not all is built up to be. Gotta go class is starting. You should check your facts. The HTC Diamond CDMA has 128 mb ram/256 mb rom. Thats the same as the Samsung Omnia. So get the Pro. No Burgandy back, physical keyboard. And by the way, "the truth" about the Diamond is that VZW fanboys are just mad that they don't have it yet and that when it finally is released on "the network", it will be inferior to Sprint's. Believe you? Not a chance. I never believe fanboys. You have to have a somewhat objective point of view if you want anyone trust your opinion. I seriously doubt thats the issue. Wishful thinking on your part. I too have tried that phone and it doesn't live up to all the hype its received. I think the other post is right. You probably regret your purchase of the Diamond and get upset when its put down. You should have at least waited to purchase it until Sprint offered their prorated ETF's. I live in Los Angeles and have both a Verizon and Sprint phone (one is work related). While Verizon is good, is "cool" and has all these features. My Sprint reception outclasses Verizon, mobile internet and voice. Verizon should be embarrassed about this in such a large metropolitan area, given their boasts of having such a "reliable" network. I drop more calls on Verizon (and it's not just one phone). That being said, Sprint has some beautiful phones, but their customer service is questionable. I'd rather have a cheap phone that works than a fancy one that fails to deliver. Sorry. I don't even have a Diamond. I HAVE seen it though and think it's a very good device. I would prefer the Pro for the keyboard though. I am number 11. Guess you thought I was number 6. The thing is, just as all the VZW fanboys are excited about the Omnia now, they were excited about the Diamond and the Touch Pro. Until they found out that VZW was going to offer stripped versions of those devices. At that point, those phones became over-hyped. Funny how that works. why would i want to go anywhere? sprints diamond has more ram than the rest of the diamonds in the world... has a better tv experience, and fast internet (faster than at&ts network)... dont be mad that the omnia, even after coming out after the diamond, hasnt sold well compared to the diamond on the international level... so what makes you think that once verizon cripples it, its going to sell? typical vzw fanboy! Oh please get over it. That phone has some good points but a lot of flaws. The TV experience is terrible unless you like choppy pixilated images, the screen is way too small to get the full benefit out of the touchflo 3d without hitting other buttons, and try typing anything with your fingers on the keyboard. Im with Sprint and had that phone and returned it a week later. Im not a vzw fanboy just livin in the real world. Does anyone know if Sprint will get the Samsung Omnia? blahh..I have man hands, only thing that works for me is a Samsung Rant keyboard. It's like broccoli and dog chewed grass had a baby.